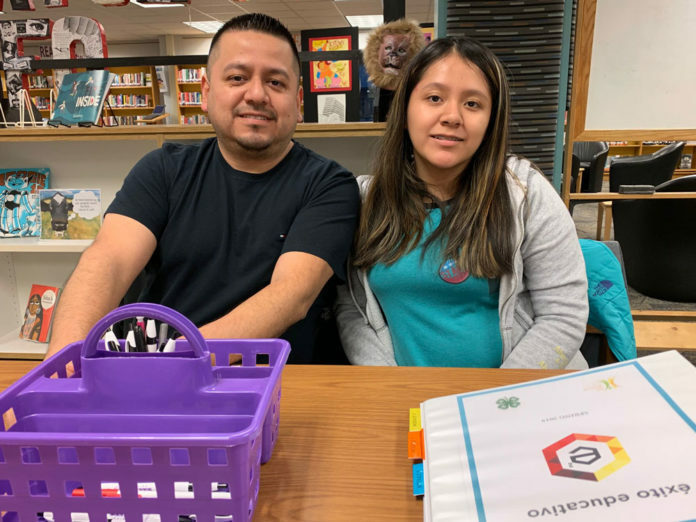 Program helps Hispanic parents, students navigate higher ed in the U.S.
Azucena Alcantara and her dad, Kevin Alcantara, are learning what they need to know for the high school junior to get into college and pursue a fulfilling career. “I want to go to college and I want to study something about medicine, but I’m not sure what yet,” Azucena said. When it comes to going to college, there’s a lot to know even for the most education-savvy families. There are academic requirements, piles of forms and loads of financial resource and scholarship information. But for Hispanic families without much experience in American education, even knowing where to start can be daunting. With her father’s help, Azucena is confident she can figure out what steps to take to get where she wants to go. “He can help me choose some colleges and know about the opportunities for a scholarship or something,” she said. 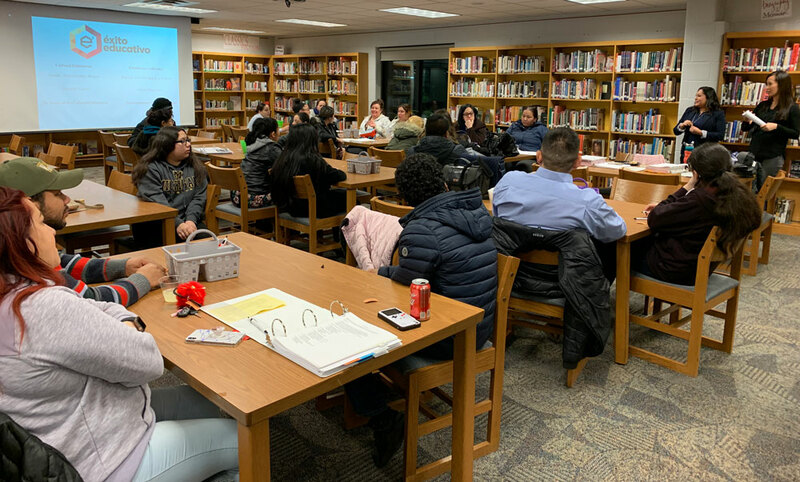 About 50 parents and children attend a weekly evening session of Exito Educativo in the school’s media center. The course, in its fifth cohort in Wyoming, was developed through the Julian Samora Research Institute at Michigan State University. 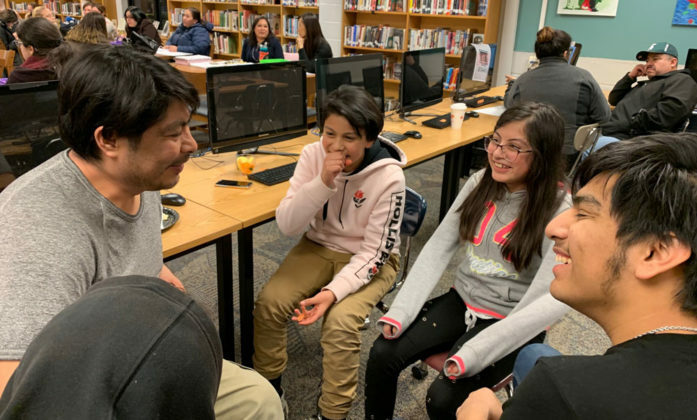 It teaches Latino families how to navigate the American educational systems, with topics ranging from high school graduation requirements to family communication, career exploration and financial resources. At Wyoming Public Schools, about 44 percent of students are Hispanic. Many will be the first in their families to attend college. While nationally, the rate of Hispanic students who go on to college has increased and high-school dropout rates have declined, barriers and myths still exist that keep them from pursuing college. They also have lower college completion rates than their white peers. Parents are eager for information, said Veronica Quintino-Aranda, facilitator and developer of Exito-Educativo. “I think every parent wants their child to go to college. It’s very uncommon to find a parent that says “no, I don’t want my child to go,’” she said. But not having had the college experience themselves in the United States makes it difficult. “They really don’t have anyone to walk them through the process because they are navigating it as they go,” Quintino-Aranda said. Latin American education systems are very different and, in some countries, poverty keeps many students from attending school, added program co-facilitator Susan Fenton. They have no information about college to reference from their home countries. 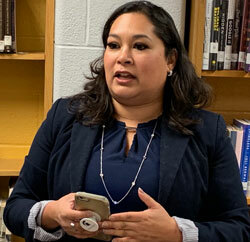 “We wanted to bring a tool for families to come be in the school, hearing from school staff and having people walking them through these processes,” Fenton said. While the program provides information on other post-secondary pathways, facilitators stress four-year degrees and beyond. They emphasize potential earnings, the difference between a career and a job, and opportunities degrees can provide. She and Fenton also work to dispel the common belief within the Latino community that college isn’t an option due to affordability and status in the U.S. “We clarify all the myths out there about why people can’t go to college and we provide them with the resources… There are resources out there available that if you want to go to college, you can,” said Quintino-Aranda. Many students who have gone through Exito-Educativo are now in college, including at Michigan State University. 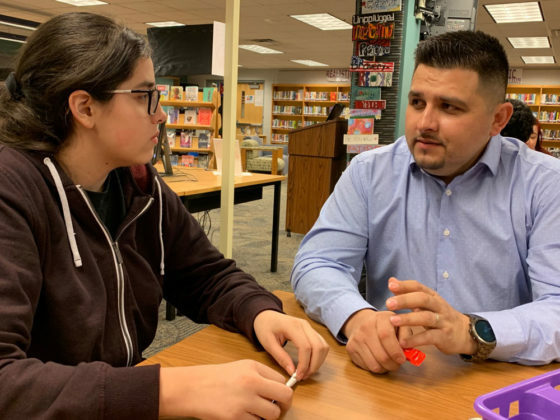 Jesus Hernandez, Wyoming High School’s dean of students, said part of the goal of the program is to introduce families to high school staff members and their roles, so they can feel comfortable making future connections. He and his wife, Jane Hernandez, completed the program with their son, Jonah, who now attends MSU. Even as an educator, Hernandez said, he learned a lot from the program. Program completion also is a source of pride for parents. Maidelin Urquiza is one of those parents. 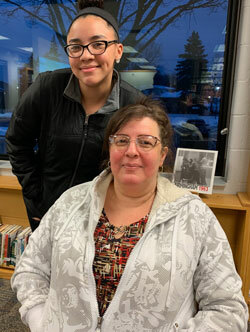 She is learning what needs to be done for daughter, junior Jessica Rojas, to go to college to become a registered nurse and work in an emergency room. “It is beneficial for her,” added Urquiza via a translation by Jessica. The family is Cuban, but settled in Israel before moving to the U.S. six years ago.